Mac users who are new to the platform and come from a Windows background often quickly want to learn how to copy and paste on a Mac. On a Windows PC, the copy command is Control+C and the paste command is Control+V, but what are the equivalent copy and paste keystrokes on the Mac? The copy / paste shortcuts on Mac are just as easy to use and as easy to remember, they’re just barely different by using the Mac command key. 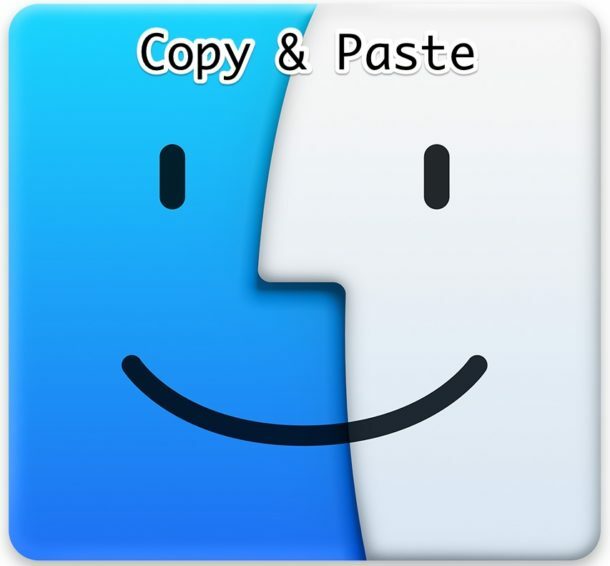 Let’s review how to copy on a Mac, and how to paste on a Mac. This will utilize the command key and both the C and V keys just like Windows. The command key is always located next to the spacebar on any Apple or Mac keyboard, it usually says “command” on it but sometimes is only identified by the command symbol. Copying and pasting on a Mac is always the same, regardless of what Mac operating system is running. 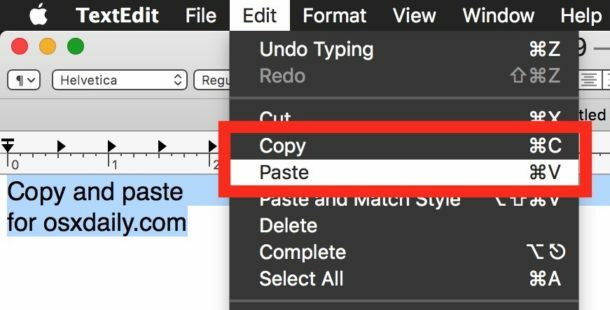 Whether it is macOS, Mac OS X, OS X, or Mac OS, on any Mac ever made, the commands for copy and paste have always been the same. Simply select some text, a picture, or an item, and hit Command + C on the keyboard to copy it to the Mac clipboard. You can also copy text or items by going to the “Edit” menu and selecting “Copy” from the menu choices. Place the mouse cursor where you want to paste the item currently copied to the clipboard, and hit Command + V to paste it into the document or at the location where the cursor is located. You can also paste text or other items from the clipboard by going to the “Edit” menu and selecting “Paste” from the dropdown menu. That’s it. Nice and easy! As mentioned above, you the menu options for “Edit” also allow Mac users to copy and paste. Using the menu system to copy and paste on Mac is perhaps an easier option for some users since it does not require using keystrokes, instead the copying and pasting can be done entirely by clicking on the appropriate menu options. Using the menu system to copy and paste on Mac is simple as well, and it’s an efficient way to copy and paste anywhere in Mac OS between apps or otherwise. Whether you use the copy and paste keyboard shortcuts or the menu items is entirely up to the user preference, though generally speaking if you can master the keyboard shortcuts for copy and the keystroke for paste, you can often navigate faster than using the menu options.